Condition: Good. Fold as issued. Ample margins. Few little spots in lower margin. Small pinhole in left image part. Verso: blank. Nicely engraved map showing the colonies from Albemarle Sound to the Alatahama River. 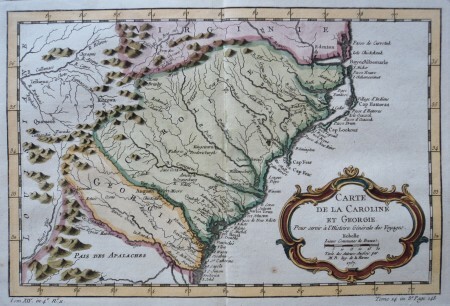 It probably owes its origin to the 1752 map of the region by Emanuel Bowen. Numerous English settlements along the coast and Indian villages are located throughout, including a number west of the Appalachian Mountains. There is more detail in the area west of the Blue Ridge Mountains than in many other maps of the period. A rudimentary course of the Tennessee River is traced in the western section of the map. The decorative rococo-style title cartouche incorporates the distance scale and date.